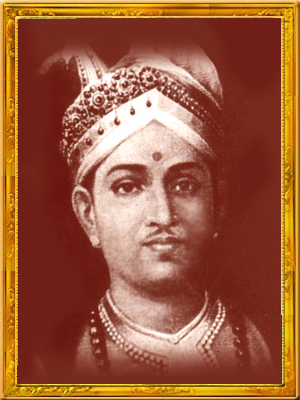 Swathi Thirunal used the mudras Padmanabha, Pankajanabha, Sarasijanabha, Saroruhanabha, Jalajanabha, Kanchanabha etc in his compositions. Almost all the compositions are addressed to Lord Padmanabha, his family diety. Group krithis are a set of songs composed on a particular theme or particular deity and each set has an exemplary status in musical qualities. The composition in the group krithis may be usually five or nine. Navarathri krithis consists of nine bristling gems intended to sing in the Navarathri Mandapam during the Navarathri festival conducted in the month of September/October. These particular songs are sung by great vidwans with Raga Alapana, Tanam,Neraval and Swara Prastharas along with other krithis in front of Goddess Saraswathi. These songs are composed in Sanskrit language and the lyrics are highly poetic, imaginary, flowering with similes, metaphors, alliterations and literary beauties. The diction and flow of sahitya are smooth, graceful and attractive with slow and swift motion. Verbal embellishments rhyming with proper sense adds to the charm of the krithis. The ornamented and beautified presentation of ideas, full fledged with decorative figures of speech, is the most significant feature of Navarathri Keerthanas. The musical structure of Navarathri Keerthanas is the same as seen in other krithis. All the nine songs have Pallavi, Anupallavi amd three Charanas. Only the first Krithi in Sankarabharanam has got four charanas. Of these nine krithis the first three songs are in praise of Saraswathi, the next three on Goddess Lakshmi and the last three in praise of Goddess Parvathy. From the above list it can be inferred that there are five janya ragas and four melakartha ragas. While the six keerthanas are set to Adi Talam, the three in Bhairavi, Suddhasaveri and Nattakurinji are composed in Chappu Tala or Tisra Triputa Tala. The theme of keerthanas is in praise of the main diety being addressed, description of the divine beauty and lastly composer’s prayer for bhakthi, request for proper guidance and plea for protection. The first three and the last krithi do not contain the mudra of the composer. However the occurrence of the word “Navarathrotsava” in the first two krithis reveals the purpose of these compositions. While the krithi “Pahi Parvatha Nandini” in raga Arabhi is the most popular in the group, “Pahimam Sri” in Kalyani is a brilliant composition characterized by the blending of swara sancharas and vilambitalaya which indicate the trace of Sopana Sangeetham. It is comparatively a long krithi having two avartanas for Pallavi, six for Anupallavi and Nine for Charanas. Krithis in Kalyani, Bhairavi and Thodi are classic examples of Raga Bhava revealing the manodharma and musical knowledge of the great composer. All the nine songs have madhymakala sahitya which is a significant feature of this group. This reminds us of the Navavarana krithis of Sri. Muthuswami Deekshithar where madhyamakala sahitya is an integral part in the composition. Ragas and Talas match well with the mood and bhava of theme underlying in the krithis. The greatness of sahitya bhava is amply revealed in the Kalyani composition. Swathi Tirunal vividly describes each aspect of Goddess Sarada’s bewitching form with rich poetic expressions. HER luxuriant tresses that resembles the dark rain clouds, her small white-bud like teeth, her wide lotus like beautiful eyes etc have all been graphically depicted in this krithi. He then prays to Goddess to make his mind, limbs and indriyaas (senses) ever engrossed in the service of her Lotus Feet. In the Bhairavi Krithi, “Janani Mamava” the raga expresses the emotions of Bhakthi and Karuna. The practice of presenting Navarathri krithis for Navarathri festival is believed to have started in 1835. In the beginning , the Navarathri Keerthanas were presented by a group of musicians called “Mullamoodu Bhagavathars” who were appointed by the Highness himself. A chief musician will sing first and others repeat. Till today, Travancore Royal Family conducts Navarathri Festival for preserving and popularising Swathi Tirunal Krithis. Maharaja Swathi Thirunal barely lived for 34 years, a span of life not enough for most of us to mature. In the short period of adult creative life, he was prolific and distinguished in his literary and musical compositions, which have carved out a special niche among the foremost composers of South. He left behind a galaxy of compositions which are both a precious and prestigious heritage in the world of Carnatic Music. His ambition was to assimilate the best in all traditions. Blessed are the souls who listen, learn and appreciate these gems !!! You are an apostle of the Goddess Saraswathi. Very informative, is there a link to all these 9 iritis! The link is given for the 9 songs in the latest post. Any way posting it here once again. ver nice and elaberate description in the mail along with the link to the 9 krithis are super.Great tribute to the prince. Very informative and Interesting.This site is a rich repository of knowledge. Am a beginner in my music journey.Would like to be a part of your workshops someday.